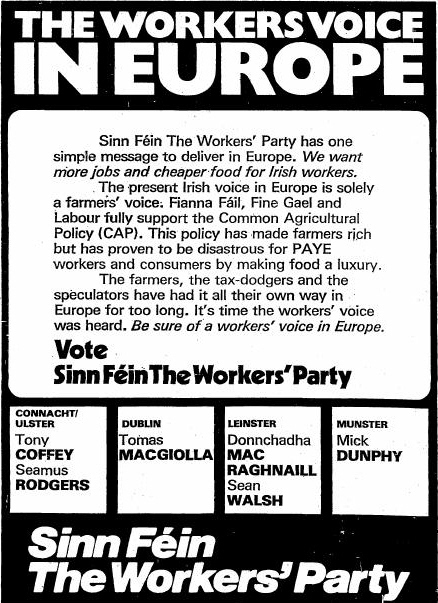 From the 1973 General Election Campaign a newsletter “Election News” from Official Sinn Fein. It includes an Interview with Tomas MacGiolla and pieces on Equality for Women, Defending the Farm and other issues. 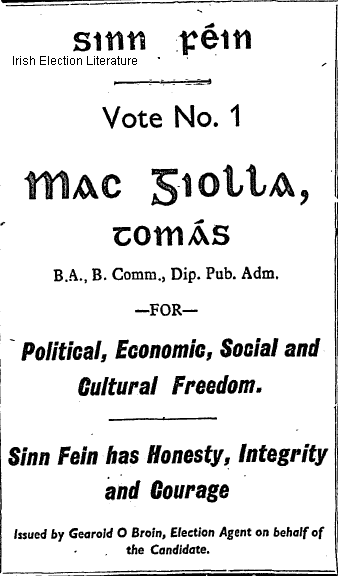 From the 1961 General Election a flyer for Sinn Fein candidate Tomas MacGiolla who was running in Tipperary North. MacGiolla polled 1,123 votes. He was later elected to Dublin Corporation and the Dail for The Workers Party. 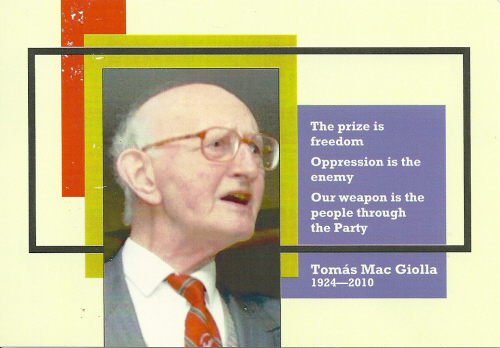 A lovely pamphlet produced by the Workers Party entitled “Tomás” – Tribute to Tomás Mac Giolla . 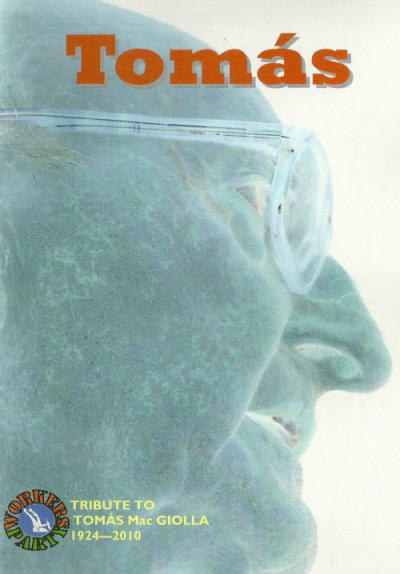 After a lifetimes involvement , Tomás Mac Giolla passed away on the 4th February 2010. I’ve some of his election leaflets posted Here, Here and Here. A remembrance card for former TD, Lord Mayor of Dublin and President of The Workers Party Tomás Mac Giolla who passed away on the 4th of February 2010. 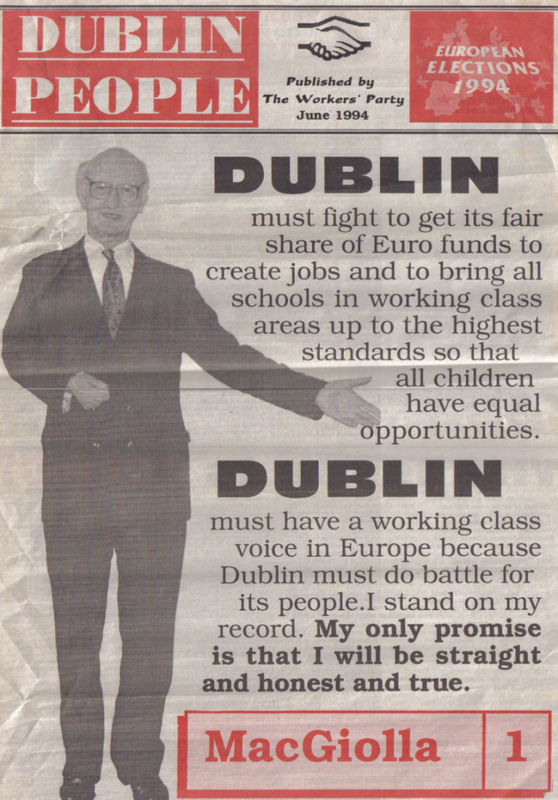 The Late Tomás MacGiolla from the 1994 European Elections. Although not winning a seat, he polled respectably. This is a freesheet given out during the campaign. It highlights The Workers Party policy on the EU. 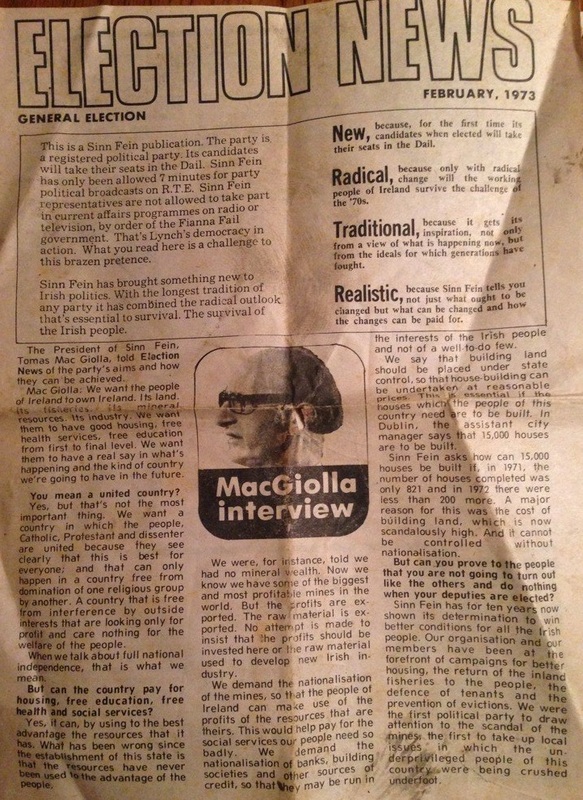 From the paper you can see how proud Tomás MacGiolla was to have been Lord Mayor of Dublin . The issues of the day both European and domestic are shown too. The real isssue though was jobs…. On this we have ‘litir um thoghcán’ usually its spelt ‘litir um thoghchán’. Having been Lord Mayor of Dublin Tomas MacGiolla writes to the ‘Dear Citizens’ of Dublin looking for a vote.